Did you know that biologically we are drawn to people who are similar to us? That must be why I have so many sweet-lovin’, healthy-minded blogger friends. I was drawn to Carolyn’s blog, All Day I Dream About Food, for the decadent treats like Chocolate Raspberry Thumbprints, Chocolate Peanut Butter Mousse Tart, and Nutella Swirl Cheesecake Ice Cream, but I stuck around for the healthful ingredients like almond and coconut flour, whey protein, and natural, zero-calorie sweeteners. Just like small appetizer bites allow us the opportunity to taste more, wholesome ingredients make a little a lot easier to indulge. For more of Carolyn’s low-carb, gluten-free recipes, visit All Day I Dream About Food, “Like” her page on Facebook, and follow @dreamaboutfood on Twitter. If you knew me in real life, you’d know that I have a little bit of an obsession with appetizers. I’ve always has a smallish appetite but a huge love of food, so little bite-sized portions delight me. They allow me to taste many different dishes and flavours without filling up on any one thing too much. Besides, there is something so ultimately satisfying about eating with one’s fingers. I can happily make whole meals out of appetizer finger foods, and truth be told, I often do. Cocktail and tapas parties are my favourite sort of get-togethers, so when Cara invited me to be a part of her Clean Eating Cocktail Party, I jumped at the chance. It was also the perfect opportunity to create a recipe that was already half-formed in my head. I hardly know from whence it came, but I had this vision of chicken nuggets or chicken tenders, well crusted in sesame seeds and lightly fried in sesame oil. And then paired with a spicy, Asian-style dipping sauce. I just hadn’t gotten around to making it, but it had all the makings of a Clean Eating recipe. I’ve always loved sesame seeds and I particularly love them toasted. Back in the days of eating bagels, which seems like a million years ago, a toasted sesame bagel was my ultimate treat. Since I’ve discovered sesame oil in the past few years, I’ve found ways to incorporate it into as many recipes as possible, from stir fries to salads. I often have my own health, and that of my loved ones, in mind when I create recipes but let’s face it: taste conquers all. And sesame seeds and sesame oil fall into both categories, making it a win-win ingredient. So thanks to the lovely mother-to-be for inviting me along to the Clean-Eating Cocktail Party! 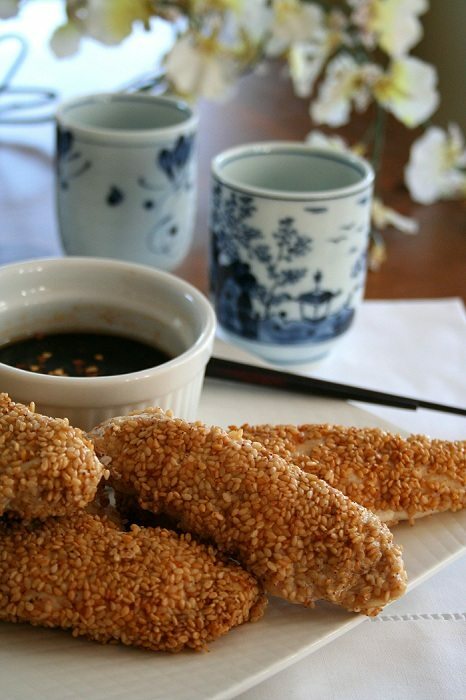 Enjoy my Sesame-Crusted Chicken Tenders with Spicy Asian Dipping Sauce! 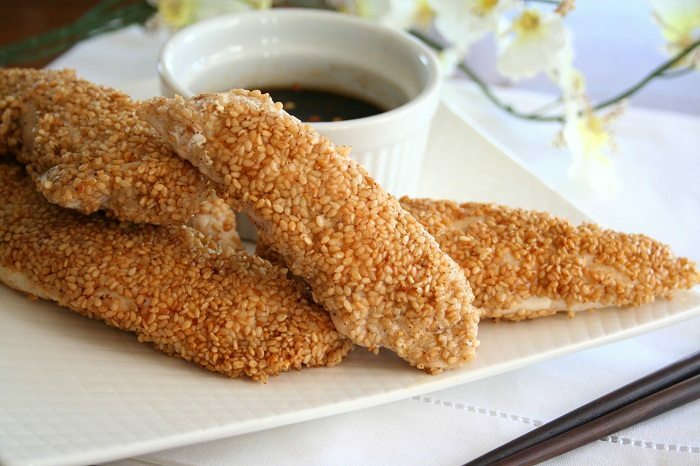 Double-sesame chicken tenders: crispy sesame coating, lightly pan-seared in sesame oil with a spicy Asian dipping sauce. A gluten-free, dairy-free and sugar-free recipe perfect as a cocktail party nibble or family-friendly dinner. For the dipping sauce, whisk all ingredients in a small bowl. Refrigerate for 1 hour. For the tenders, whisk egg white in a shallow bowl until slightly frothy. Spread sesame seeds on a plate. Pat tenders dry with a paper towel, then season lightly with salt and pepper. Dip in egg white, and then dredge in sesame seeds to coat. Shake off excess. Heat oil in a large skillet over medium high heat, until shimmering but not smoking. Place chicken tenders in skillet and cook until browned, about 4 minutes per side (you may need to do this in batches, depending on the size of your skillet). Drain tenders on a paper-towel lined place. A Family that Cooks Together, Eats Together! This is an awesome, family-friendly…yet stupendous paleo weekday dinner…definitely in my immediate two-week meal rotation!…This would be amazing with a combo of golden/black sesame seeds…or a golden sesame/nigella seed mix as well!….Thank you so much for your inspiring paleo recipes….Recent discoverer of your blog…Excellent! I made this tonight and it was DELICIOUS!! I haven’t been able to find a great chicken recipe until i came across this one. Thanks so much for posting! I will definitely be making this dish again. This sounds amazing. As I am on a very strict diet I was wondering if you had the nutritional values so I can see if this is allowed for me.